Step 1. Put the flour and a little sea salt into a bowl, add chopped butter and rub in until the mixture resembles coarse bread crumbs. Add 3 tablespoons of ice cold water and mix with a butter knife until the dough comes together, wrap in cling film and leave to rest in the fridge for at least 30 minutes before rolling out. Step 2. Roll out onto a lightly floured surface to a large round, to the thickness of a 1 pound coin. Use to line the tin and trim off the excess. Chill again for at least 30 minutes. Step 3. Heat the oven to 200C, 400F. Line the tart case with tin foil and baking beans and bake blind for 15 minutes. Step 4. Brush the inside of the tart case with egg white, and then cool. Remove the foil and bake for another 5 to 10 minutes. Step 5. Slice the spring onions on the diagonal. Melt the butter in a pan, add the spring onions, season, and cook gently over medium heat until soft but not browned. Remove and allow to cool slightly. Step 6. Blanch the asparagus in a pan of boiling water for 2 to 3 minutes; they should still retain a bite. Step 7. Drain and refresh under cold running water, then drain well. Cut the asparagus spears in half lengthwise. Step 8. Whisk the eggs, egg yolks and cream together in a bowl. Reserve a good handful of Oak Smoked Yorkshire Wensleydale cheese for sprinkling, and the rest of the cheese to the creamy mixture and season well with sea salt and fresh ground black pepper. Step 9. Sprinkle half the reserve cheese in a thin layer over the pastry base and scatter over the spring onions. 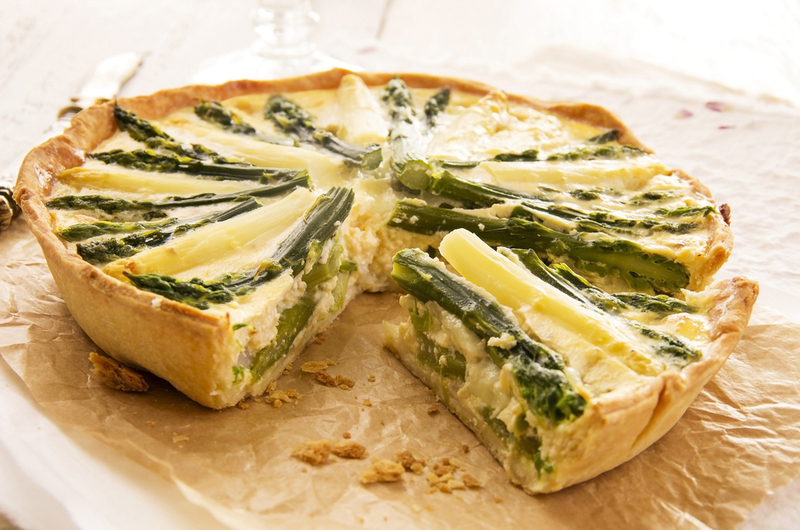 Arrange the asparagus on top, then carefully pour on the creamy mixture to just below the rim of the pastry. Sprinkle with remaining cheese and bake for 30 minutes at 180°C - 350°F, until the filling is set and golden.